Those features include a video camera and microphone mounted on the back of the iPod, an FM radio with buffering and iTunes Tagging capabilities, a larger screen, a built-in speaker, expanded accessibility support, and a pedometer for keeping track of your footsteps. Additionally, the $149 (8GB) and $179 (16GB) nanos come in an array of nine bright colors: silver, black, purple, blue, green, orange, yellow, pink and [Product] Red. The dimensions of the 5G nano are identical to that of its predecessor, the fourth-generation (4G) iPod nano ( ). Yet, hold the two side-by-side and the 5G iPod appears to be taller than its sibling. Place them on a table and the illusion disappears. What creates this illusion is the 5G’s 2.2-inch (diagonal) display—0.2 inches taller than the screen found on the 4G nano. The difference may not sound like much, but when you compare the two, you see that Apple has taken advantage of the extra space by enlarging the fonts and placing a little more space between menu items (as well as placing more items on the screen, in some cases). To accommodate the longer screen, Apple moved the clickwheel down a bit as well as made it a little smaller. Its position and size make it no more difficult to use than the previous nano. The 5G nano's display (left) is longer than the 4G nano's display (right). The obvious difference between the backs of the two models is the camera lens and microphone unit found on the bottom-left of the 5G nano. And the bottom of the newest nano has the headphone port on the left of the Dock connector (as you look at the display) rather than on the right side (its location on the 4G nano). The other difference you’ll notice is that if you press Play without connecting your headphones, the 5G nano will play audio through a new, internal speaker. Its sound quality is comparable to that of the iPod touch—very tinny and useful only for previewing songs or, if you’re just this side of desperate, listening to the audio that accompanies the video you’ve just shot. The feature that has garnered the greatest attention is the nano’s video camera. When Steve Jobs introduced the 5G iPod nano he compared it directly to Pure Digital’s popular $149 Flip Ultra standard definition pocket camcorder. The idea being that, like the Flip camcorders, the 5G nano provides you with an ultra portable video camera that’s incredibly easy to operate and is likely to be used in situations where you don’t care a great deal about the quality of what you shoot. The new video camera is located on the bottom left of the back of the iPod nano. Using the camera couldn’t be much easier—though it’s not quite as easy as pushing the Flip’s Big Red Button. Just choose Video Camera from the nano’s main menu, press the Center button, and the nano's display becomes a viewfinder. Press Center again and the nano starts recording. Unlike most pocket camcorders, it does not display a red recording light on the front of the “camera” nor make a noise when it starts recording. For those concerned about privacy as it relates to video taken on the sly, this could be an issue. You can also add effects to video as you shoot it. Just navigate to the viewfinder screen and press and hold the Center button. Doing so produces a screen that contains 15 video effects (plus a Normal setting). Among the effects you’ll find are the descriptively named Sepia, Black & White, Film Grain, Cyborg, Kaleido, Twirl, and Stretch. If you’ve ever used the video effects in Apple’s Photo Booth or iChat, you have a good idea of what these things do. The effects are permanent, however—they are added as you shoot and can’t be removed. Press Center again to stop recording and the video is added to the nano’s Camera Roll screen. Videos are organized there by date. Select a date, press Center, and any videos you’ve shot on the selected day appear in a separate screen. Choose one using the clickwheel, press the Center button, and the video plays in the orientation in which it was shot. (If you shot it in landscape orientation, you can rotate the nano either to the left or right and the video will rotate along with the nano.) To delete a video from the nano, just select it in the date screen and press and hold the Center button. A drop-down menu appears offering Delete All, Delete, and Cancel options. When you plug a 5G nano that contains recorded video clips into a Mac, iPhoto opens by default and offers to import the clips. Video is encoded in 640-by-480 resolution using the H.264 video codec, with 44.1kHz AAC audio, at a total data rate in the range of 2500 to 2800 kbps. You might think that the placement of the nano’s camera will cause a lot of people to shoot video of the inside of their palms. Not so, if you’re careful. If you prefer to shoot in portrait mode, just turn the nano upside down so the lens sits above your hand. The nano understands that it’s standing on its head and when you transfer the video to iPhoto, the clips will appear right-side up. Clever. I did, however, manage to move a finger in the way when shooting in landscape orientation. To help prevent that, I vowed to rotate the nano to the right so the lens sits at the bottom-right (from the subject’s perspective) rather than the top-left, where it’s easy to obscure the lens with your right index finger. Steve Jobs was careful not to compare the quality of the nano’s video to that of today’s pocket camcorders, and rightly so. For its intended purpose—shooting videos of your friends and family and posting the results up on YouTube—the nano’s video is acceptable. But it’s not as good as video shot by an iPhone 3GS ( ), which isn’t all that good, much less the video shot by most of today’s dedicated pocket camcorders. I compared the nano’s video to that shot by an original Flip Ultra pocket camcorder. Outdoors, the nano’s video was darker and bluer than the Flip’s. Much of what it shot looked drab. Indoors, under natural light, the nano failed to pick up detail and stuck with its blue tendencies. Under lamplight at night, its results were just poor—full of noise, washed out, and producing unhealthy skin tones. The 5G iPod nano is a very poor indoor shooter under lamp light. Nano on left, standard definition Flip Ultra on right. With all the talk of the new nano’s video camera and exercise features, it’s easy to forget that it’s primarily a media player. And as such, it performs as you’d expect a modern iPod nano should. I plugged several pairs of headphones into the new nano and I was as pleased as ever with the sound, playing MP3, AAC, and AIFF files. I then connected it to my Sonos system’s Line In port and was just as happy with what came out the attached B&W speakers. Video is larger on the 5G nano (top). The 5G nano uses a TFT display whereas the previous nanos have used LCDs. Compared to my 4G nano, the 5G’s display is a little bluer. Take the older iPod away, however, and you don’t notice it. Video is enhanced by the larger screen. I compared the same episode of Dexter on 4G and 5G nano screens and although the picture was only slightly larger on the 5G nano, every little bit helps and the difference between the two was noticeable. The 5G iPod nano also expands on some of its sibling’s features. 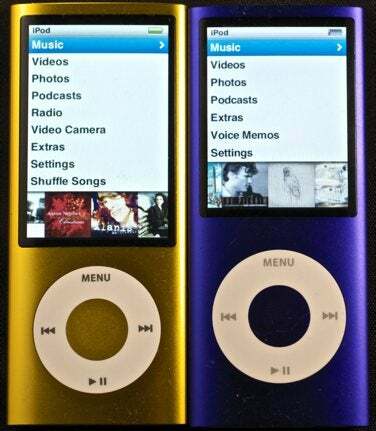 For example, the 4G iPod nano introduced a Spoken Menus feature that, when enabled, allowed the iPod to speak the name of highlighted commands, screens, and controls. This was a boon to the visually impaired or blind, allowing them to finally navigate an iPod. The 5G iPod nano retains this feature but also adds a separate VoiceOver feature. With VoiceOver engaged, you can hear the name of the currently playing tune within the Now Playing screen by pressing the Center button. You don’t have to be visually impaired to find this useful. VoiceOver is a far safer way to learn the name of a song and its artist than taking your eyes off the road while driving with an iPod. VoiceOver kits are available for Chinese (Cantonese), Chinese (Mandarin), Czech, Danish, Dutch, English,	Finnish, French, German, Greek, Italian, Japanese, Korean, Norwegian, Polish, Portuguese, Russian, Spanish, Swedish, and Turkish. VoiceOver can be enabled without also switching on Spoken Menus. However, if you enable Spoken Menus in iTunes, VoiceOver is also turned on. You can switch Spoken Menus off within the iPod’s General settings screen. The only way to turn off VoiceOver, however, is to disable the option in iTunes and then sync the iPod. 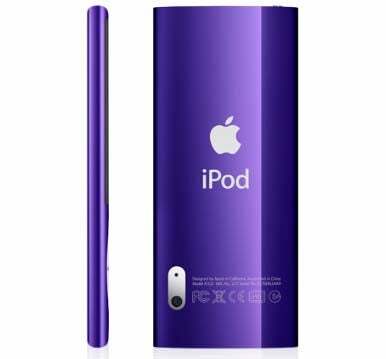 Voice Memos were not new to the 4G iPod nano—the nano’s been able to record memos with a compatible microphone since the second-generation model. What is new is that you no longer need a microphone to record these memos. Just choose Voice Memos from the Extras screen and you’ll see a screen reminiscent of the iPhone’s Voice Memos application. Press the Center button and the nano starts recording through the built-in microphone. The 5G nano saves its recordings as 128kbps AAC stereo files. The previous nano saved files in a mono Apple Lossless format. Note that you needn’t flip the nano around and shout at the mic to make yourself heard: the mic will pick up your voice either way. However, if you do speak into the back of the iPod you’ll get better results—both in terms of volume and representation of your voice. I got a richer baritone sound by flipping the iPod around to the back, as opposed to a somewhat tinny sound when I talked to the front of the iPod. As with the previous recording-capable nanos, voice memos are moved to your iTunes library when you sync the iPod. One of the more unexpected features that arrived with the 5G nano is FM radio. This is a feature that some users have been clamoring for since day one, and Apple has finally relented. But, typical of Apple, this is more than the standard FM radio you find in other MP3 players. Sure, you can tune the radio from 87.5 to 107.9 by using the clickwheel. You can add favorite stations by simply selecting a station, pressing and holding the Center button, and choosing Add To Favorites from the drop-down menu. And you can scan for stations with a strong-ish signal by pressing and holding the Forward or Back portion of the clickwheel while viewing the radio dial, and the iPod will grab the next strong station, play a bit of it, and then move on to the next solid frequency. 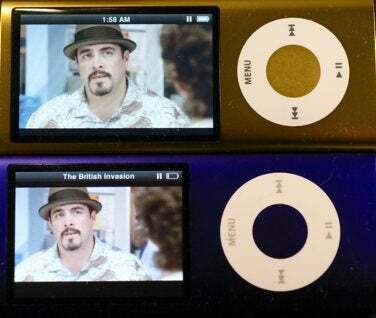 The 5G iPod nano's radio buffer feature. What makes this radio interesting is that you can “pause” and buffer 15 minutes of radio playback. To test the radio I plugged the nano into my car’s auxiliary input jack, chose a station, and headed to the local petrol emporium as the tank was running dry. As I stepped out of the car I pressed the Play/Pause portion of the clickwheel to pause the playing station. I pumped the gas, paid the bill, jumped back in the car, pressed Play/Pause on the nano, and the broadcast picked up where it left off without a discernible change in the quality of the audio. For fun, I pressed Play/Pause to stop playback. This produced a timeline with a time readout above it—1:51 AM, for example. I then swiped my finger counterclockwise around the clickwheel to rewind back in time (up to 15 minutes). To move forward, I pressed Play/Pause and swiped in a clockwise manner. You can’t save any of this audio or sync it back to your computer. Once 15 minutes has elapsed, the buffer begins to empty, dropping the oldest audio as new audio is buffered. Regardless, this is a great feature, particularly if you’re often interrupted during a favorite radio broadcast. Another unique feature of the nano’s radio is its ability to save iTunes tags. 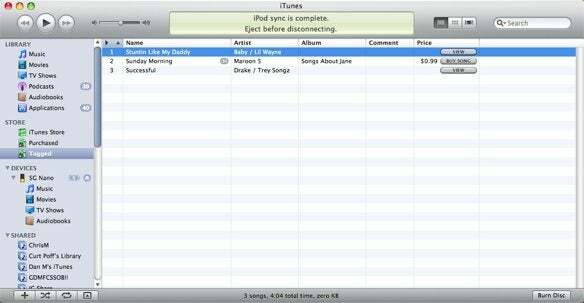 Tags are bits of data embedded in audio files broadcast over radio stations that support iTunes Tagging. 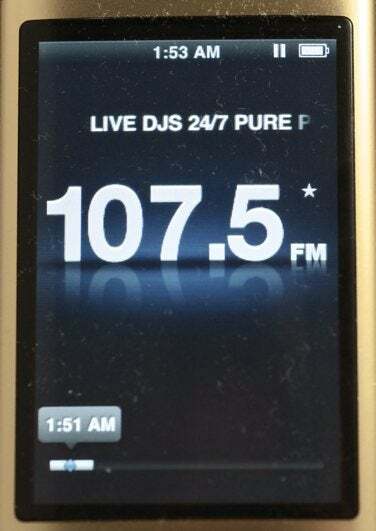 When the iPod is tuned to one of these stations and a tagged song comes along, its title and artist appears below the radio station number readout with a small Tag icon next to it. Press and hold the Center button and you’re offered the option to tag the track. This places the song’s title in the iPod’s Tagged Songs screen. More importantly, when you next sync the nano, the track’s name, artist, and (in some cases) album appear in a new Tagged playlist that appears under the Store heading in iTunes Source list. In that playlist you can choose to preview or purchase the song. If you often listen to stations where the DJ’s fail to name tunes, this is a great resource.